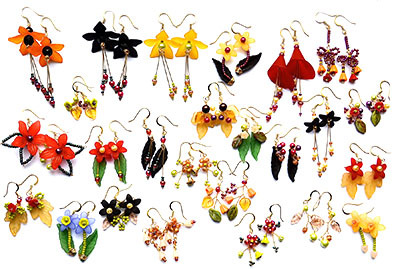 Create 25 pairs of floral earrings in time for summer! When Christine at Spellbound Bead Co asked me to review this creative pack, I will be perfectly honest and tell you that I didn't think I would need the instruction booklet that comes with all the supplies. I've made lots of flowery earrings before, and thought I'd find the designs included far too easy. Boy, was I wrong! 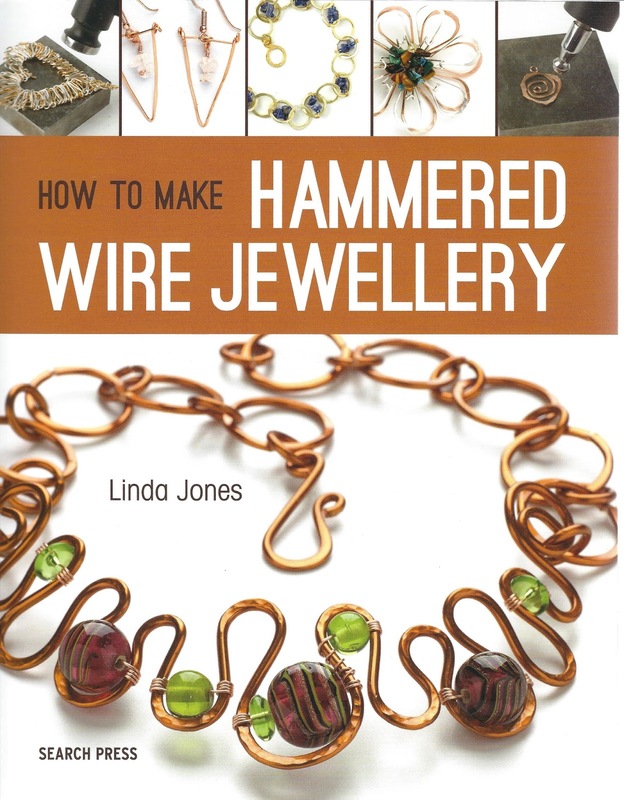 I learned lots of new techniques, particularly in creating stems and stamens from wire, and the designs I made from the instructions provided were so much better than those I might have come up with on my own. Looking at what comes with the kit — alongside the detailed instruction booklet comes a selection of lucite shapes including leaves and flowers of different types, three sizes of seed beads in a variety of colours, lots of tiny glass trumpet flowers and leaves along with glass pearls, facets, headpins, silver plated wire and enough earring findings to make 25 pairs of earrings. All you need to add are the tools. Just a pair of round nosed pliers, wire cutters and chain nosed pliers should suffice. Oh, and a tape measure if you want to follow the instructions precisely and cut all your headpins and wire lengths exactly to size. My first piece of advice when starting with this kit echoes that given on the first page of the booklet included. Make sure to read the 'Before You Begin' section that covers all the techniques and materials needed. 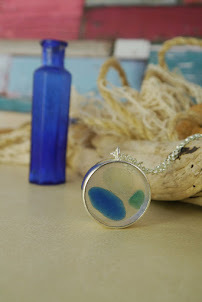 It will help a lot if you understand all the different lucite shapes too! If you are new to jewellery making or to the techniques used, then it is definitely a good idea to start with the simpler designs introduced first in the booklet. I should say here that the designs are very sensibly ordered so that you may master simpler skills first before adding in more tricky techniques using wire. I began with the Bluebells earrings and worked my way through the next eight designs before I had a go at earrings further on in the booklet and even having a go at my own designs. Each design has a clear list of the ingredients required and a lovely photograph of the finished earrings so you can check your work easily. One of the great things about this kit is that none of the earrings take very long to make. You could whip up a pair to match your summer dress at a moment's notice, or quickly create a last minute gift for a friend. Available in Candy (pink, white and blue), Garden (purple, pink and lilac), Azure (blue, green and purple) and Autumnal (black, red and gold), you will find it tricky to choose which colour way to buy. I tested the Azure kit but I now have my eye on the Autumnal pack with its inclusion of reds and bolder colours. Here are some of my finished earrings displayed on my new flower pot earring stands. Find out how to make the pots here. The Country Garden Earrings Creative Pack is available from Spellbound Bead Co and is priced at £29.95 which works out at around £1.20 per pair of earrings! We have a pack to give away to one lucky winner! To enter, just leave a comment on this post with your preferred colour way and we will pick a winner at random after midday on Monday 6th June. Which colour will you choose? Angela Finch - please email us at helen@thebeadinglibrary.com and we'll arrange for your prize to be sent. 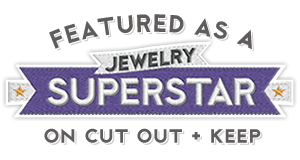 Display Inspiration Series:2: Stepping up my jewellery display! If you make jewellery to sell, how you display it should be just as important to you as the jewellery pieces themselves. I show you just how original and different you can make your retail presence with minimal expense and a little creative thinking. Whilst being busy with The Beading Library and working hard on newsletter tutorials and other projects behind the scenes, I have also been spending time on my own jewellery business Ring O' Roses - Original Jewellery by Helen Bowen. On a recent trip to Malvern, I cam across a crate of mini terracotta flower pots outside an antique shop. All suitably full of character (read: dirty and battered) and cheap as chips. I picked up ten to begin with before I even knew what I was going to do with them but ended up going back for another five once I'd had some interesting ideas for jewellery stands! In my head I had a series of pots with miniature wooden trellis for displaying a new range of flower themed earrings. 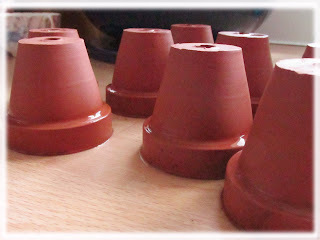 I'd spotted some cheap terracotta coloured clay in The Works which I though would be perfect for both weighting the pots and securing trelliswork but my first task was to design and make the wooden framework that would allow me to hang earrings. Balsa wood is a popular material in model building and other craft applications and is easily available on Ebay in all sorts of shapes and sizes. I bought a couple of ten packs of balsa wood strips (3x3mm square) that came in foot long lengths and started with a simple ladder design. The wonderful thing about balsa wood of this size is that you can simply cut it with a pair of sturdy scissors. I cut strips into side supports around 12cm tall and cut four smaller pieces for each pair, each about 3cm long. Here they are glued together with PVA and awaiting an application of woodstain (pilfered from my husband's shed) to make them look a little more realistic. Once I was confident using the wood, I ventured into making more complicated designs. These fan-shaped supports are my favourite and are the strongest but obviously they use more wood and are quite time-consuming to make! 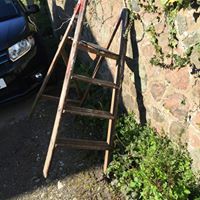 At this point in the proceedings, I came across these medium sized step ladders on a local recycling site - free to a good home! I immediately thought what a great set of shelves they would make for my little pots but as my husband pointed out, I would need to secure the pots somehow if I was going to leave them at the mercy of customers in a retail environment! Hmmm! This was going to need an engineering solution! I decided that what I needed were some bolts that I could screw through the steps and into the flower pots (which conveniently all had a single hole in the bottom). However, I also wanted to be able to stand the pots up independent of the ladders if required, so simply embedding a bolt that protruded through the hole in the bottom of the pot, was not going to work. If I filled the pots with clay as I intended to, I wouldn't be able to remove the bolts or access the inside to screw and unscrew a nut. I spent two days traipsing around DIY and hardware stores in the area, trying to describe to various helpful staff what I wanted. Some 'metal things that I can stick in clay and screw a screw into that aren't rawl plugs and that I can screw and unscrew as I like' didn't seem to exist! But then I somehow stumbled on the right Google search terms and hey presto! Screwfix's threaded metal inserts were the perfect solution! I used two part expoxy to glue an insert to a 30mm washer which would stop the insert from shifting around in the pot or, worse still, falling out the hole in the bottom of the pot. I then glued the washer/insert ensembles into the bottom of the pots and checked the M6 screws I'd bought (50mm long) would screw in and out easily! It was then time to fill the pots with clay. I screwed in the screws so clay didn't creep down the hollow insert and filled the pots up to the collar with clay. Do you notice the rather appropriately themed workstop saver I used to work the clay? I only just spotted it! While the clay was still soft, I pushed the trellis supports into it so they were firmly embedded. I also found some rather fun little chalkboard picks at The Works which I trimmed down and stained to match the trellis. I left them all to dry thoroughly. Once dry, I noticed that the clay had shrunk away from the edges of the pot slightly (clay shrinks by up to 10% apparently when it dries) so I needed a solution to cover the gaps and look a little more soil-like. A trip to Wilkos (yes, it's amazing the things you find in there!) and I was all set with a large bottle of PVA and some bird grit. I spread a good thick layer of PVA over the clay surface and sprinkled on the grit generously. I left to dry and shook off any excess. My attention turned to the rather sorry looking step ladders that I'd picked up locally. A good sanding down, and a new slat to fill the gap in the top platform helped a lot. Then a coat of woodstain and the addition of my business name in white chalk paint (using a home made stencil!) gave them the right look. I marked holes for the bolts to go through (five on each shelf) and borrowed my husband's drill to make the holes needed. And here is the finished display! It wouldn't have been out of place at last weekend's RHS Malvern Spring Show.I now need to finish the jewellery collection that will be placed on it and decide where I am going to install it! What do you think?